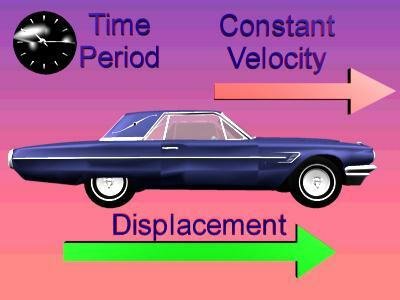 In this picture we consider that the car is moving through equal displacements per equal time intervals, and this is what is meant by a constant velocity. Note that the constant velocity would be aimed in the same direction as the equal displacements. Then the automobile is moving with a constant velocity. The automobile moves equal distances over equal times. For the above example, if you were looking at the speedometer in the car, the speedometer would not change its value. Then the automobile is not moving with a constant velocity. The automobile moves unequal distances over equal times. Then its velocity is not constant. If the automobile follows a curved path, then its velocity is not constant, no matter if its speed changes or not. Mr. Explain discusses changes in velocity. An object can change velocity in a number of ways: it can slow down, it can speed up, or it can change direction. A change in speed, or a change in direction, or a change in both speed and direction means that the object has a change in velocity. Understand that in physics this means if you turn a corner, even if your speed is constant, your velocity changes. In the above equation d is the displacement from the object's starting position to its ending position, and t is the time over which the displacement occurred. Knowing d and t, we can calculate an average velocity. However, we can not claim to know exactly what the velocity was at a certain instant in time, just the average velocity over the whole time period.